The remarkable story of Dorothy Edwards, Enriched Services Coordinator at WORKS’ Teague Terrace community, is featured in the online Washington Philanthropy blog written by Bill Pitkin of the Conrad R. Hilton Foundation. Teague Terrace is a WORKS community housing 56 households, comprising individuals with developmental disabilities and formerly homeless people with special needs, including homeless veterans. Unit rents are affordable to households earning 25% to 40% of Area Median Income. Teague Terrace opened its doors in September 2015 and has provided desperately needed homes and stability to people who’ve been living on the edge of survival. WORKS’ partner, Housing Works, provides case management and wraparound services to help with mental, physical, social and financial recovery. In addition to housing and wraparound services, Teague Terrace offers a program of Enriched Services to help residents build community, gain skills and education, improve health and nutrition, and find recreation and create beauty in their surroundings. Dorothy Edwards is the queen of enriched services at Teague Terrace, organizing classes, events and involvement opportunities for residents. And Dorothy is the ideal person to head up these offerings – she herself was homeless and addicted to drugs when she connected to supportive housing like Teague Terrace through WORK’s partner, Housing Works. With the support of Housing Works ‘wraparound services’, Dorothy moved into supportive housing, conquered her addiction, and rebuilt her life. Today, she is helping other people who’ve faced situations similar to hers do the same. 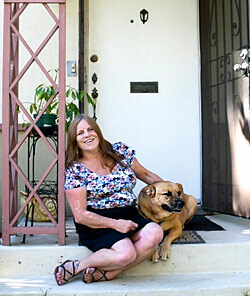 Check out her story at: http://philanthropy.washingtonmonthly.com/portfolio_page/hilton-foundation-combating-homelessness/.